In order to complete warranty registration or to receive warranty status, please fill out necessary fields. For autonomous heaters manufactured by LLC ADVERS and accessories provided by LLC Autoterm we provide a 24-month manufacturer's warranty. All replacement parts are warranted to be free from defects in material and / or workmanship for six months from the date of sale or the remainder of the original warranty period on the heater, whichever is longer, proof of purchase need to be submitted together with the warranty claim. 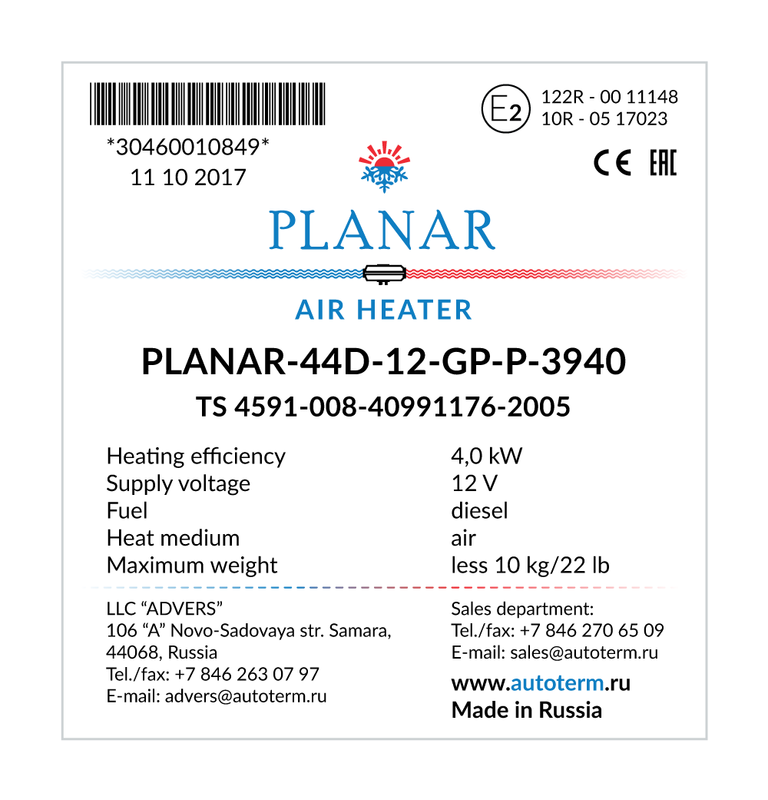 the terms of exploitation attained 24 months from the date of purchase of the heater. the warranty resource to engine liquid pre-heaters 1000 working hours. If not reported within 14 days from the time of purchase, manufacturer does not accept any claims on incompleteness and mechanical damages after sale of heater. Warranty is valid from the moment a certified service or specialist by Autoterm has registered heater with warranty certificate. If installation was done by end-user or uncertified specialist, it must be / inspected by Autoterm certified specialist. To register warranty, original purchase evidence ( purchase receipt, invoice) must be shown to a certified service at the time of registration of the warranty. The intent of the Autoterm warranty is to protect the original end-user of the heater from defects and provide free repair and replacement of defective parts in the manner provided herein. During the warranty period, the exclusive remedy will be for Autoterm, at their discretion, to repair or replace those parts if they are defective in material or workmanship. improper installation, which is not in accordance with valid, supplied installation instructions or approved OEM applications. While warranty is provided to the “original end-user”, it is to be administered and serviced through an authorized Autoterm dealer in accordance with the heaters warranty terms. With the warranty case it is possible to apply to any official partner of Autoterm company. The warranty ONLY covers manufacturer's defects; the warranty does not apply if the ordered part has been incorrectly, unprofessionally mounted or used, as well as in case of use of a poor quality fuel and another intentional or unintentional failure of the buyer/user. The definition of the warranty case is carried out by LLC Autotherm or authorized dealers or, in the event of failure to contact the dealer.